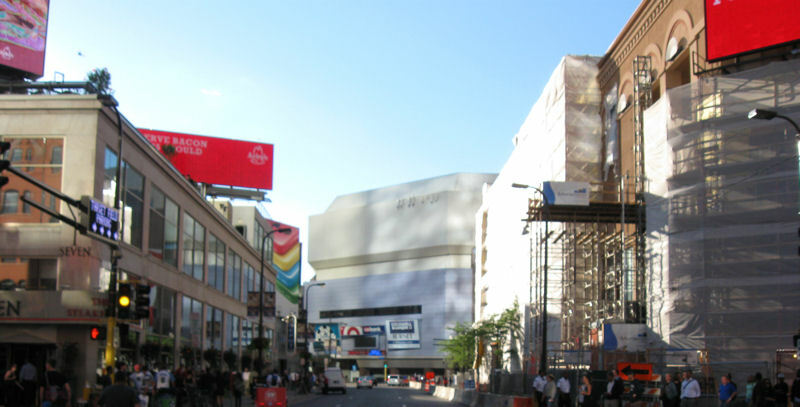 2014 Road Trip Photos #19: Twin City II: Minneapolis « Midlife Crisis Crossover! Mary Tyler Moore takes a nothing day and suddenly makes it all seem worthwhile in front of the still-open Macy’s at 7th and Nicollet. After spending the first several hours of Day Four walking around downtown St. Paul, we crashed at the hotel for a while. As someone who hates naps, that’s hard for me to admit, but it had to be done. We needed to recharge for the sake of our evening plans, for which we’d be driving into downtown Minneapolis to create a fun bookend effect for our day in the Twin Cities. That evening we tried something we’ve never done before on vacation: a formal anniversary dinner. In our fifteen years of annual road trips, 2014 was only the second time we’ve had a reason to pack nice clothing. Last time was in 2009, when we had to stop at a family wedding on the way home. We budget a fair amount for meals so we don’t have to spend all week alternating between McDonald’s and Subway, but we’re not the kind of upper-class travelers with hundreds of experiences dining at five-star three-figure establishments. Such extravagance is a rarity for us. This is not who we are. But this week marked our tenth wedding anniversary. This was also the first time in over a decade that we’ve had an extended trip to ourselves. We agreed the milestone ought to be observed in a rare moment of style. Day Six would be the actual day of, but that day’s plans wouldn’t have meshed well with the kind of dinner we had in mind, and most of Day Five would be spent driving to and in another state. Minnesota was this year’s primary road-trip objective, so Minnesota is where we opted to do this thing. 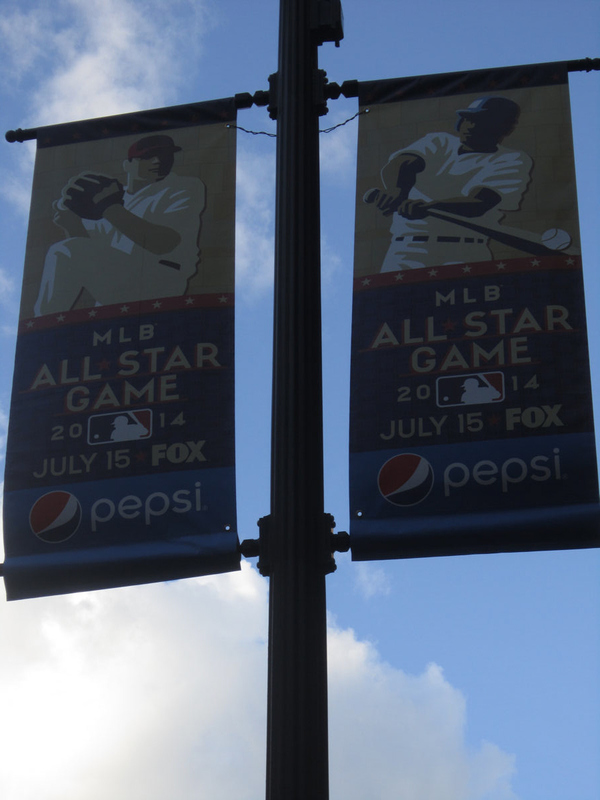 If we’d paid closer attention to the local banners and discussions we saw around town on Day Three, or if either of us were a sports fan (neither of us is), we might’ve been forewarned that we’d chosen to head into Minneapolis on the exact same evening as the 2014 Major League Baseball All-Star Game at Target Field. Of all the baseball stadiums in all the major North American cities, of all the possible days of the baseball season, thousands of baseball fans had to walk into this city on this day. To its credit, Minneapolis tried to warn us it had already made other plans. We got all gussied up. We drove west from our St. Paul hotel. We got ourselves trapped in rush-hour traffic that was probably extra-strength because of sports. We did a few laps around downtown until I could find a parking lot with an open space, five blocks from our destination and far from free. By the time we got the car tucked away and hit the pavement, most fans were already inside the stadium. Not long prior, there’d been hundreds or more still milling about, clogging intersections, loitering or networking or shopping or whatever it is sports fans do when they’re wandering streets instead of finding their seats. Target Field was that-a-way, due west, the opposite direction from where we were headed. So we had that going for us. Bonus points if the construction site at right reminds you of previous entries. Despite the traffic delays and yet another long walk, we’d left ourselves plenty of margin and arrived earlier than our reservations. Thus we settled in for a lovely evening at Murray’s Steakhouse. Their advertising material mentions live music, but we knew that might not apply on Tuesdays. Long story short: we loved it and we enjoyed ourselves together. 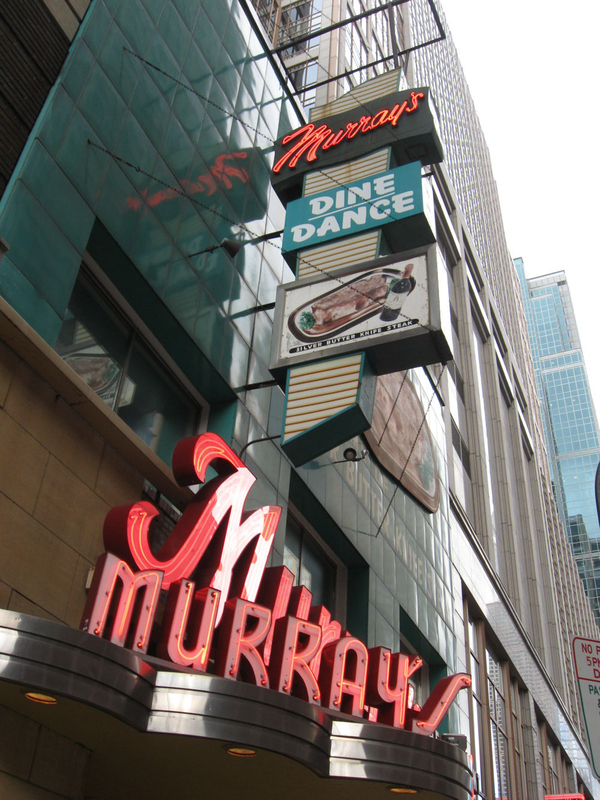 We don’t know enough about high-end steakhouses to tell you how Murray’s compares to others of its level. Some other blogger with ten thousand times as many followers as me could tell you the pros and cons, place it in culinary context, make some foodie jokes you’d get and we wouldn’t unless it invokes ingredients used on Chopped, and remain Hero of the Internet while I toil in middlebrow obscurity. Which I’m cool with, most days. 1. Escargot was the cheapest appetizer on the menu. 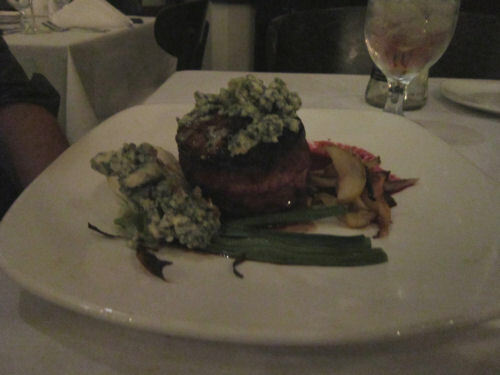 In our minds this clashed with the classic escargot mystique. 2. Escargot was served in tiny versions of those dishes your aunt uses to bring deviled eggs to picnics. They taste like tiny protein pills steeped in rich, creamery butter. We approved. 3. Customer service was above and beyond in all aspects, and I’m not just saying that because they gave us free cake. 4. We took very few photos because we wanted to minimize the number of ways in which we looked and acted like rubes. 5. For the photos we did take, we turned of the flash and produced terrible, fuzzy results. Murray’s lighting is subdued, romantic, cultured, and dimmer than what you’d expect to see while spelunking. The least worst pic of that batch: my dinner of bacon-wrapped tenderloin and carrots in agave glaze. My wife probably had the fish. The important thing is our tenth wedding anniversary dinner exceeded expectations. 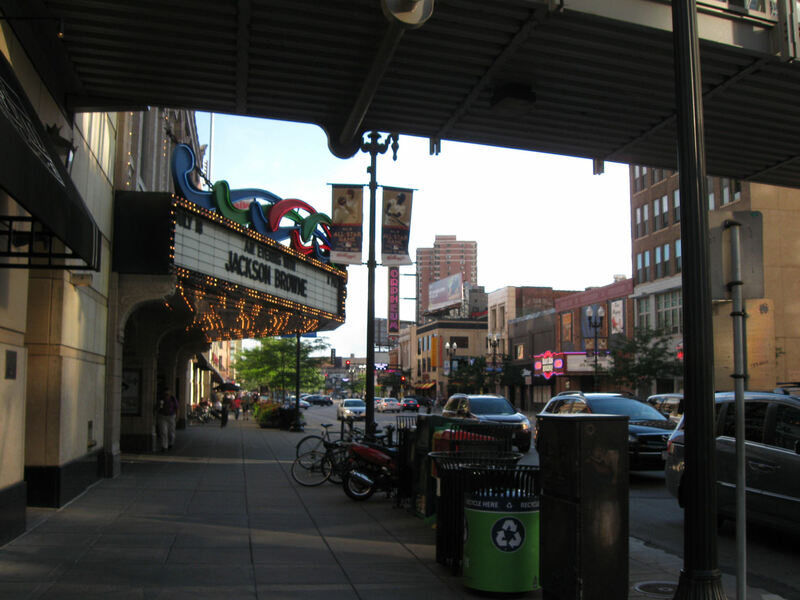 The rest of the evening, we wandered Minneapolis. No place else in mind, just seeing what was to be seen. The crowds thinned, the younger folks began to outnumber the suits, and the sports fans had cleared the streets. 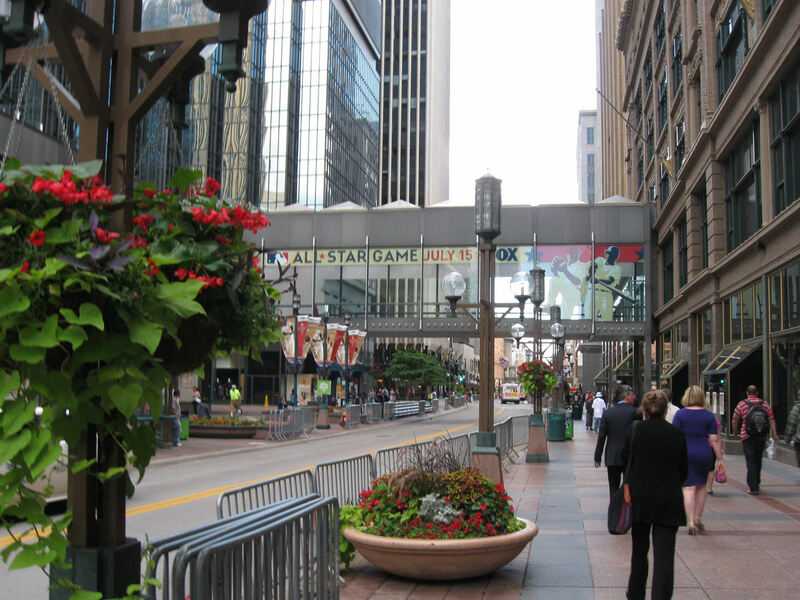 Downtown Minneapolis, shortly after rush hour and during a major sporting event, offers ample greenery and walking space. 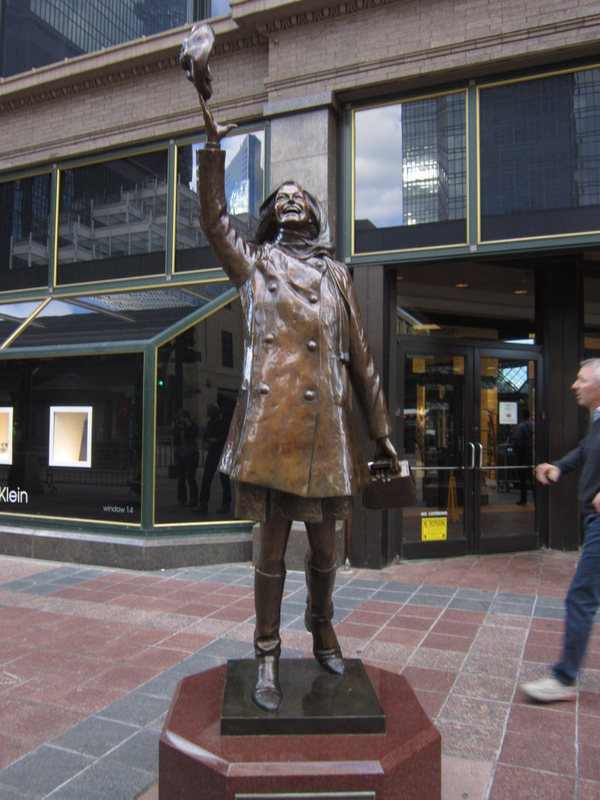 Correction: my wife had one particular spot she wanted to revisit: TV Land’s Mary Tyler Moore statue at Nicollet Mall. I touched on that stop previously in the remastered version of our 2006 road trip, and even shared a teaser photo for this entry you’re now reading. You’ll note in the 2014 photo in that linked entry, she was quite pleased to have the opportunity for retakes with the esteemed Ms. Moore. There’s TV Land, asking itself easy questions so it can look smart. While wandering the cultural section, I added two new places to my marquee collection. It’s just this thing I do. 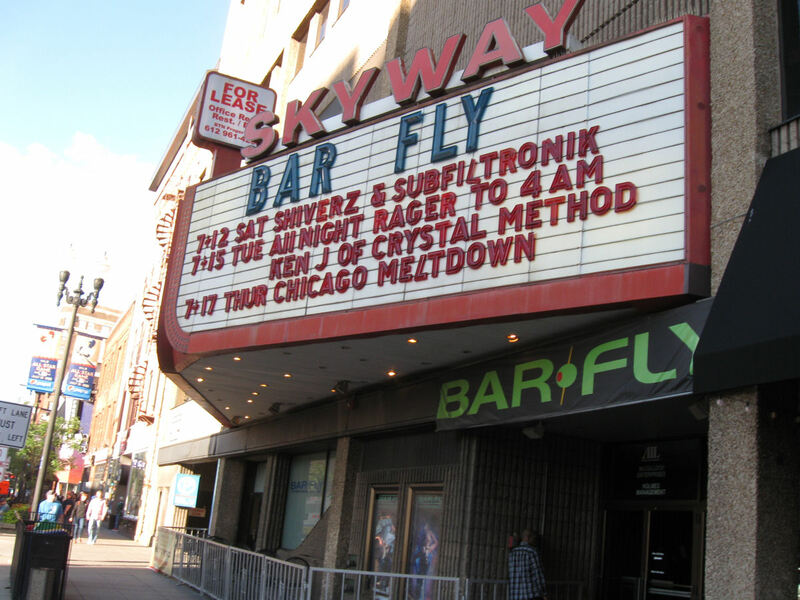 I know Hüsker Dü once played some clubs in the area, and maybe one or two of them are open today, but I didn’t want to be the guy standing there starstruck, staring at a club where Bob Mould and Grant Hart once rocked out and seethed at each other, and trying to suppress a squeal. Also, clubs aren’t usually our scene. Meanwhile in another town, the other guy from the Crystal Method doesn’t need the money and is perfectly fine with his choices. If there were a musical act capable of enticing my wife to a rock concert, it would definitely be someone from the ’80s. Nice try, Jackson Browne. I recall one other stop: a Barnes and Noble, where I took advantage of a well-timed Criterion Collection half-off sale and picked up copies of Ace in the Hole and Scanners. My wife had the audacity to pay for them and declare them gifts. I’d given her anniversary gifts before we left home (one of them was a travel item that would serve her well), but she went with surprising me on the go. This was our tenth anniversary date. I got movies. She got TV Land statue photos. This is who we are.